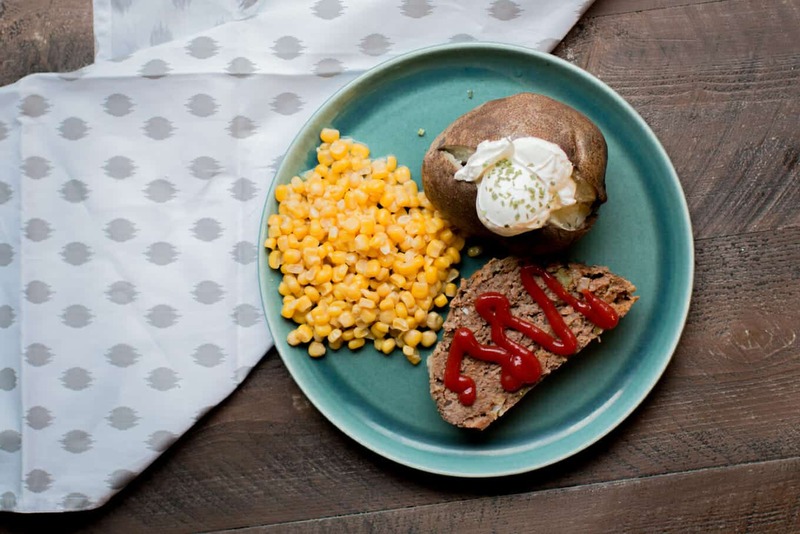 You can make an entire meal in the slow cooker with this Slow Cooker Meatloaf and Baked Potatoes Recipe. If you love meatloaf, you really should try cooking it in the slow cooker. Sometimes in the oven the meatloaf can get tough on the edges but in the slow cooker I find that it stays tender throughout. This week instead of just cooking a meatloaf, I added potatoes as well. The potatoes cooked up great wrapped in foil on top of the meatloaf. If you have a favorite meatloaf recipe, you can try it in place of mine, just make it about a 2 pound size. I know not everyone likes bell pepper in their meatloaf, but that’s how my mom made it, it smells so good while cooking. To plate this meal I removed the potatoes onto a plate, sliced the meatloaf and served with corn. A salad would be great too! This meal is great for those who are busy all-day and want to come home to a great meal. I hope you try it. 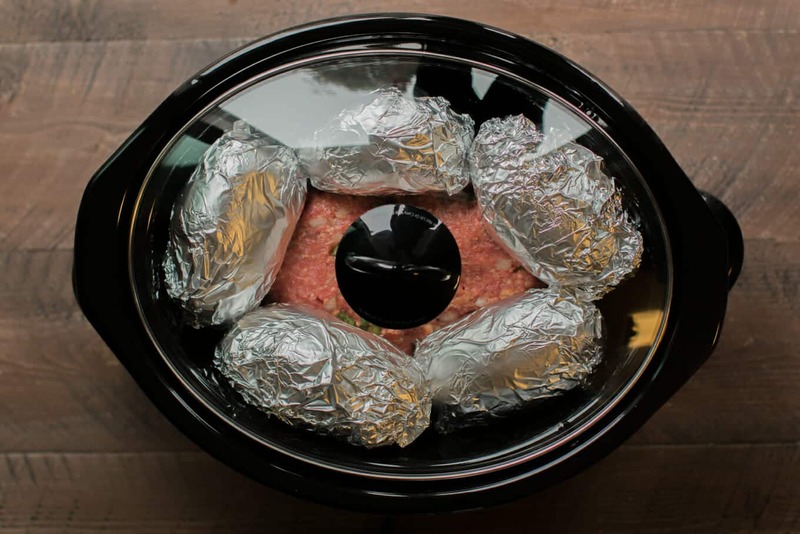 Meatloaf and baked potatoes both cooked in the slow cooker at the same time. In a large bowl add the meat, eggs, onion, bell pepper, ketchup, milk, garlic powder, salt and pepper. Mix together with a spoon or clean hands. If meatloaf seems to wet to form into a loaf add more cracker crumbs or if too dry add a touch more milk or ketchup. Form the meatloaf into a loaf in the slow cooker. 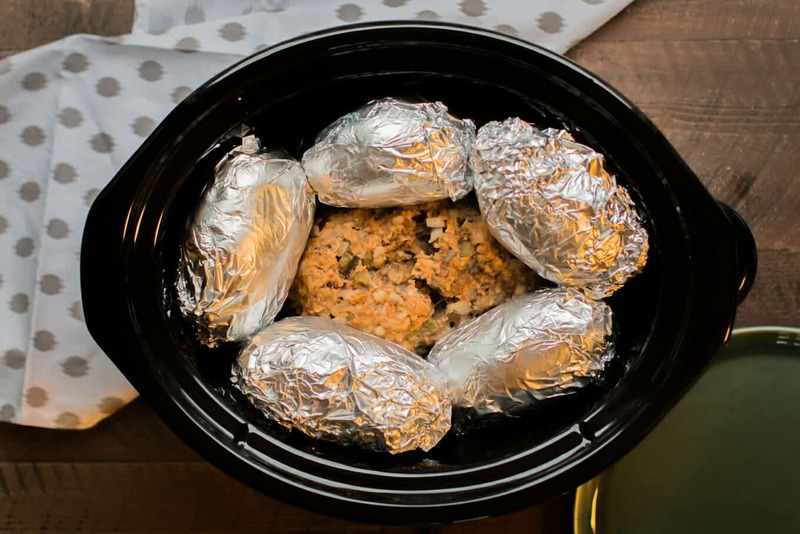 Wash and dry the potatoes and wrap each of them in foil. 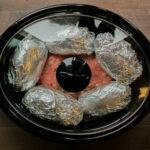 Place the potatoes on top of the meatloaf toward the sides of the slow cooker. Nutritional information is an estimate. If you have a special diet please use your own calculations. 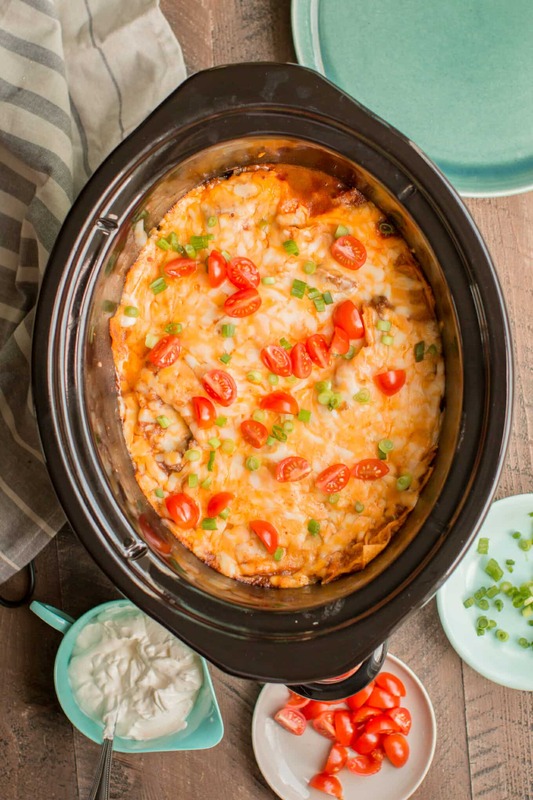 I used my 6-quart Crock-Pot for this recipe. I don’t recommend any slow cooker smaller than a 6-quart for this. Love the chicken recipe can’t wait to try the beef! Hi Sarah! 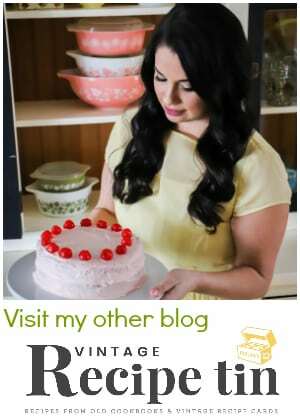 This delicious recipe reminds me of one I have used, probably 45 years ago. My copy has been lost for a very long time. I actually cut it out from the box of crackers. I’m really looking forward to trying it in my Crock-Pot! Thanks! I wonder if that’s where my mom got the idea! 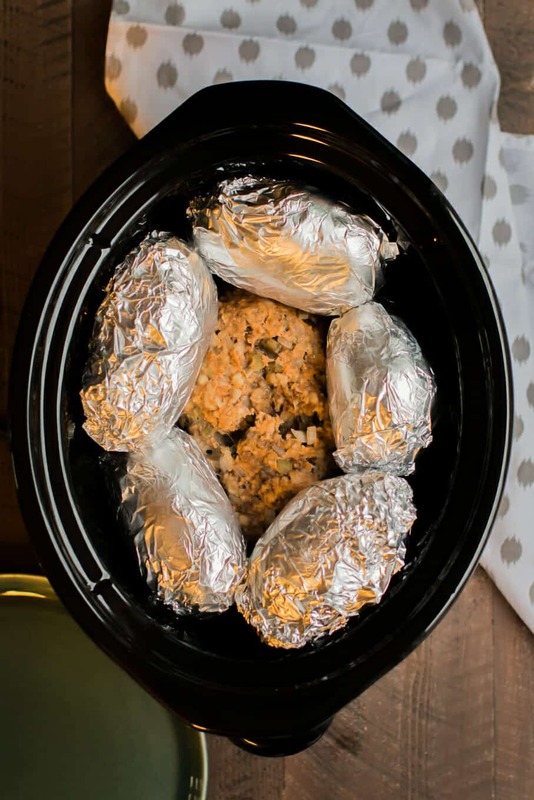 Did you pierce the potatoes before you wrapped them in foil? any type of plain crackers. Do you have Ritz there? Substitute ried bread crumbs for the crackers. Would it hurt to only do 2 or 3 potatoes? OMG……..tried the beef enchiladas……….WOW!!! VERY VERY good!!!! 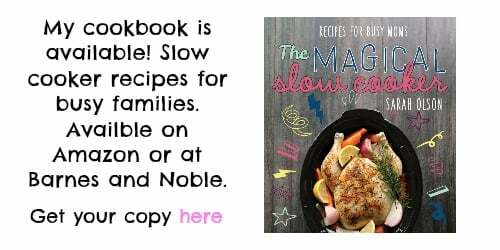 I love this recipe already! Meatloaf and baked potatoes is one of my favorite combos! Do you think you could make this with ground turkey versus beef and maybe shorten the cooking time a little? The potatoes will need 8 hours, let me know how it turns out if you try it. Do you cook it on high or low for 8 hrs??? How long would cook just the meat loaf?! Can I cook without potatoes? If so how lovely Gn for meatloaf? Hello do you have to wrap the potatoes in foil? No! I often do sweet potatoes and baked potatoes on top of pork without foil and they do fine. What would the cooking time be on high heat with 1 pound of meatloaf and 4 potatoes? Can you coom on med or high to reduce the time? Looking forward to weekly newsletter. I have made several of your recipes so far and love them all, your making me a better cook and I wasn’t to bad to start with 🙂 Thank you!!! Keep them coming. I have not tried. I would look up similar recipes online to see if there is an pressure cooker version. 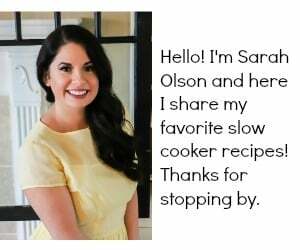 My wife found a recipe at This old gal site for the instant pot. It does call for a special pan, like a small bundt cake pan. She got one on the internet. 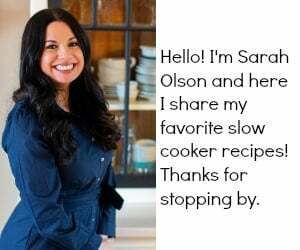 Thanks for this recipe Sarah! I’m trying it tomorrow night for the wife and kids for the first time. I have a feeling it’s going to be a hit though! Just got done prepping this tonight for easy throw together in the morning! I just chopped my pepper and onion and mixed my seasonings with my eggs and milk and crushed my crackers. I also went ahead and wrapped my potatoes! That way tomorrow I can just mix it and form it and toss it and go! I’m sooooooo busy in the mornings! So excited to try this! I’ve done the same thing! let me know how you like it. Can i substitute the milk with water? 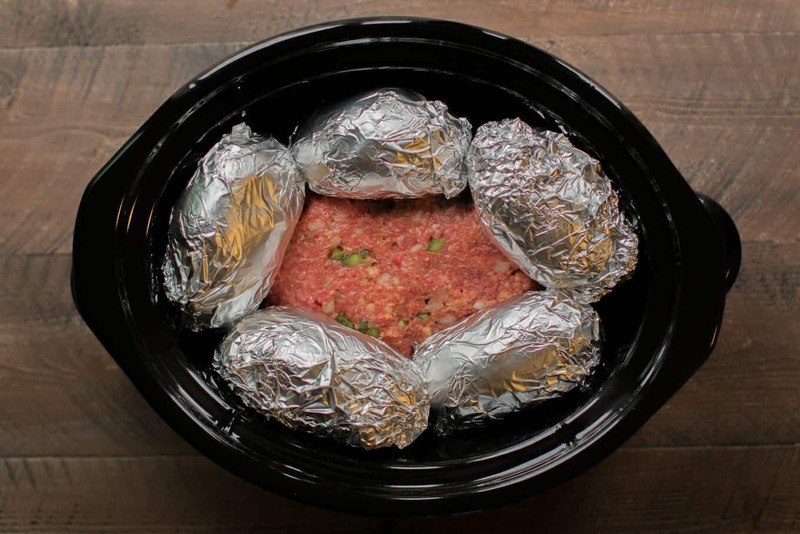 Hi, slow cooker meatloaf with baked potatoes sounds amazing. How many ounces should each potatoes be so they are all done in the 8 hours? Thank you. I have not tried, has anyone else cooked this on high? Si I started out with two pounds of beef and have no idea where it went. The meat thinned out and has dents where the potatoes sat on it??? What the heck?? That could happen if your meat is wetter than normal. I’m sorry that happened. Can I mix everything and put in frig. In the crockpot And in morning put potatoes in and turn crockpot on and put pot in holder before leaving work. Yes, that would work fine. I do that often. One tip I have is to let the slow cooker sit on the counter for about 10 mins to get the chill off of it, so it won’t crack.